If our democracy is to thrive, we must teach children the skills they need for critical reflection and thoughtful civic engagement. Research tells us that people who have been educated in civics are more likely to vote and be involved in public life. So how do we start early to empower children to understand their roles and responsibilities as active citizens – and to participate effectively in our democracy? Here are five easy, hands-on ways to help kids begin to see how they can help create the world they want to live in. 1. Learn. Discover how government works – by playing games! You'll find kid-friendly activities that teach about government – all for free – at icivics.org. 2. Vote together. Take your kids to the polls with you. Show them the ballot. Talk about why it's important to make time to vote -- and why you voted for the candidates and issues you did. 3. Write a letter. Decide on an issue that matters to you and your children. Then craft a letter (or drawing) advocating for your position, whether it's to your school principal, your council person, your senator, or the president. Explain why your family cares about the issue, pledge what YOU plan to do about it, and ask the letter's recipient what he or she will do to help. 4. Visit your state capitol. Tour your state capitol building together. And take a virtual tour of the U.S. Capitol! 5. Show support. Depending on their ages, take your children along when you attend local meetings, go door-knocking to get out the vote, visit your representatives, or go to speeches and rallies. 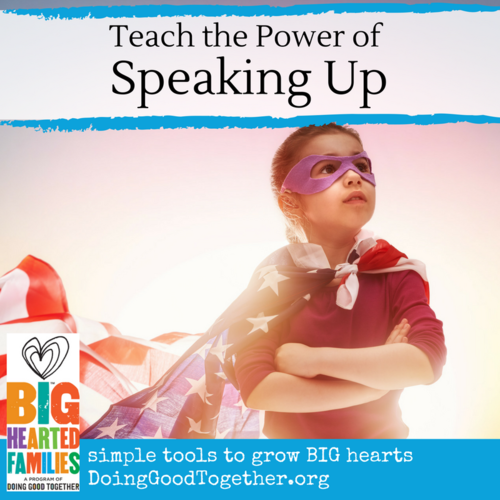 Talk about why the issues deserve your time, and how your actions can make a difference. Ask questions that encourage children to think critically. There's an election in November. Do you know who's running for office? What questions would you ask the candidates to help you decide whether to vote for them? What things at your school don't seem fair? What could you do to change them? Do you know what a protest is? Why do people protest? Do you think protests can be an effective way to bring about change? Why or why not? Would you like to join student government at your school? Why or why not?